I should be posting more. I know. I should finish up th Tarot thing I started. I know. But I have really good excuses. Not only did I have to recoup from Dragon Con, I was hit with an allergy attack, and I have a major deadline. But this past weekend rocked, got over 6,000 words written and am ready to wrap up book three, FATAL CIRCLE and have time to tidy it up nicely so the wonderful editor won't knock me over the head for using certain words too many times. :-) And stuff like that. I'll be back to the Tarot as a Story Prompt thing soon! Finally recouping from the event, I am able to blog about it and I must say...I had an absolute BLAST (no Star Wars/Star Trek pun intended) at my first ever Dragon Con. As the picture below may show, my grin couldn't be stopped. That's my writing-group pal Laura Bickle in the white wig--her fabulous book EMBERS will be out next spring. Conan the Barbarian didn't know how close to doom he truly was with a giddy writer on each arm. "You sooo wouldn't look gay in that shirt." "I love seeing celebrities. It makes me feel like I'm somewhere important." "I found Jesus. Twice! And he's a mean drunk." "Was it good for you, or not?" "If you cut the zombie penguins, I quit." "These panels always make me feel dumb and inobservant." "I haven't been dumpster diving since college." "Let me exterminate you with my love." "No matter what it looks like, it's not a hangover. It's con fatigue." **Mumbled by man taking photo of man in Alien costume: "I bet his nuts are sweatier than mine." This was Dracula, a dream come true meeting (please just ignore the mood-killing restroom sign over our heads). Allow me to clarify, that is not camera shake creating that blurriness. There was something mystical and dreamy about the experience. I felt blurry in Vlad's presence and it had nothing to do with the margarita. 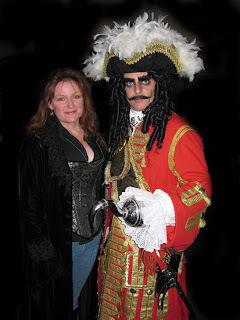 And here is the Holy Grail of Pirates...Captain Hook. And last but not least, Davy Jones, who--as fate would have it, shares his name with one of the Monkees. He is, if you recall the movie, a musician as well. 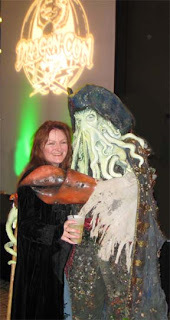 Not recognizing my groupie attitude, he politely reminded me that he could move each of his tentacles individually, as if I didn't know he's wicked awesome on the pipe organ. (That was not intended as a smutty reference but as I type it, yeah, I find myself venturing there...).